1. Format as much as possible to print 2-up on a page. You will make half as many copies and they’ll fit in a composition book easily. 2. Put a sticky note on the top of the stack with the Interactive Notebook page number and the date you gave it out. Keep the sticky notes and a marker with the wall organizers. Ooh, if they’re printed 2-up, go ahead and cut them in half (you have no idea how many kids won’t even realize they’re taking 2 copies when they grab a full sheet of paper). 3. 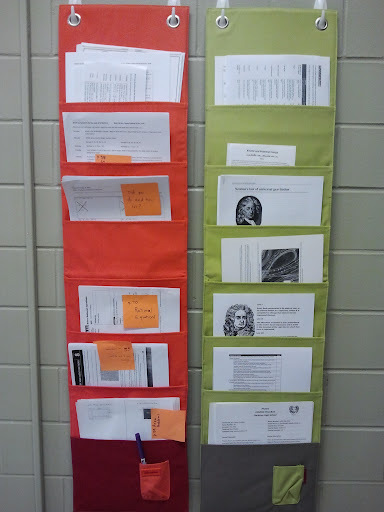 Go get yourself a wall organizer ($15 each) from the Container Store for each prep you teach. They’ll hang almost anywhere if you use Command Strip hooks (mine were up all year long and came down with nary a mark on the cinderblock wall). I rotate the most recent stuff into the top pocket and shuffle older stuff down. When papers get to the bottom, I file a copy and pitch the extras. If you want this to NOT stress you out & be easy to maintain longterm, farm all of steps 2 & 3 out to a student. I usually hand a stack of papers to my helper and she knows what all to do. Hmm, what else are you going to ask me about? On average, I’d guess I had about 3 handouts per week in math. They were usually problem sets or tasks/projects. They often were attached to right hand pages (the input side of my notebooks). Don’t ever let kids leave the room without attaching papers in their notebooks. This spirals out of control quickly if you let it go till tomorrow. Kids can keep everything they need for your class in a gallon resealable bag. Mine held a composition book, a pencil, colored pencils, and a glue stick (which I recommend against in the next bullet — read on). Scissors were community property and easily accessible to all. If you have a choice, use tape to attach handouts. If every kid could have their own roll, you’d save a tremendous amount of time getting handouts into the notebooks. With experience, I can suggest against glue sticks and staples. The glue gets too brittle with use and everything falls out anyhow. Staples bulk up the book and can rip pages too easily. Dinah Zike wrote the book on foldables designed for notebooks, literally. Check it out. What am I glossing over? Throw down in the comments so I can update with answers. In closing (did I really just 5 paragraph essay y’all? ), deciding to go with Interactive Notebooks does invite a certain amount of paper clutter. Trust me when I say to get a kid to help you manage it. Once I trained mine, I barely thought of the system the rest of the year. There ya go. Something I made for math class. This is part of the #made4math Monday series invented by @druinok and @pamjwilson. awesome! i cannot wait to hear more at TMC!!! I have Container Store envy… 🙂 Thanks for sharing! I was looking for a great way to organize the weekly handouts so that when my students come in from their study halls they don’t have to interrupt my teaching time with other kids. You just gave me the exact idea I needed! Thanks! This is excellent! I love the information and your explanation of using the ziplock bags for storage was very helpful! I have sleeves on the students’ chairs and it would be so easy to keep the ziplock bag there for easy access! Thanks!